Set in the fictional Burnam Prison, “Mickey B” tells the story of one prisoner’s quest for power through betrayal, violence and murder, and the insanity and death that results. The film is unrated, but is recommended only for mature audiences due to language and themes. 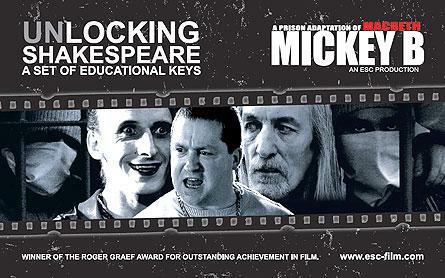 The film was shot in Northern Ireland’s Maghaberry Prison and features 42 characters played almost entirely by prisoners and prison staff. Prisoners carried out crew work, including set building, painting, continuity and assistance with production, sound and make-up. ESC is an award-winning arts education charity specializing in drama and film working with people experiencing extreme marginalization within society. ESC has worked with prisoners, ex-prisoners, youth at risk, community and forensic mental health patients, survivors of trauma, prison officers’ widows, medically retired prison officers, young homeless people and young people suffering from cancer. More about ESC is available online at esc-film.com. Magill, who co-founded ESC in 1999, is an award-winning filmmaker, drama facilitator, actor, writer, director and producer. He specializes in theatre of the oppressed and Shakespeare using theatre methods for transformation in community and prison settings. He has presented his film work in Ireland, Britain, Germany, Denmark, the Netherlands, Israel, the United States, Canada, Nigeria and South Korea. Hope students have had an opportunity to interact with him and visit ESC in Northern Ireland through the college’s “Celtic May Term: Peace and Reconciliation in Northern Ireland and Scotland.” As part of the four-week course, students meet with ex-prisoners and former paramilitaries from both the Nationalist and Unionist communities in the Northern Ireland conflicts, some of whom are also actors in the film. Magill’s visit to Holland was organized by Holland resident and award-winning prison arts practitioner Curt L. Tofteland, founder of Shakespeare Behind Bars (shakespearebehindbars.org), who met him at a 2012 international conference in the Netherlands, where they were both keynote speakers and each screened their award-winning films. Upon his return to the United States, Tofteland negotiated and scheduled Magill’s American tour. The tour begins with the Hope screening, and continues at the University of Notre Dame, Emory University, Oxford College and Oakland University with screenings of both “Mickey B” and “Shakespeare Behind Bars,” which focuses on development of a production of “The Tempest” at Luther Luckett Correctional Facility in LaGrange, Ky.